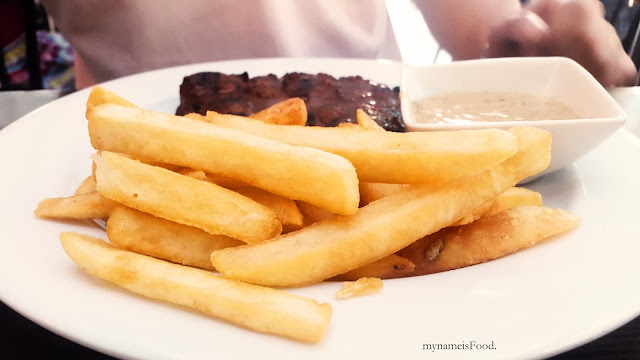 Hurricane's Grill, Surfers Paradise, Gold Coast - my name is Food. 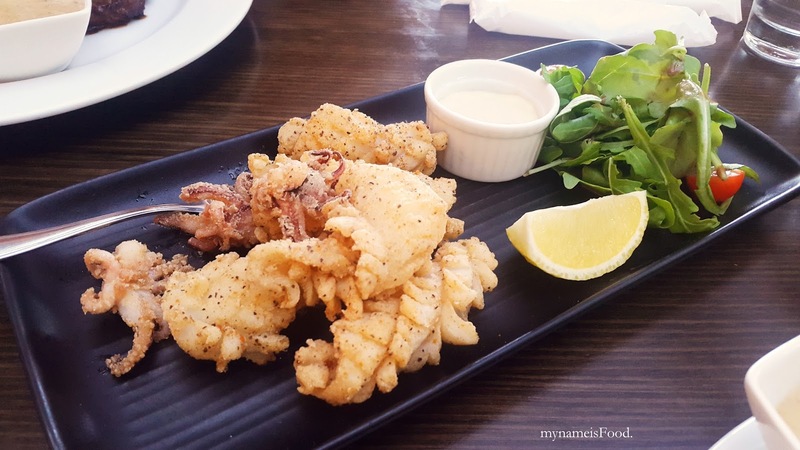 Starting off with starters of 'Fried Calamari' ($18) served with a quarter of lemon wedge, tartare sauce and a bit of garden salad. An okay portion, was crumbed and spiced well however, there were maybe about 4 or 5 squid bodies with about 3 tentacles. 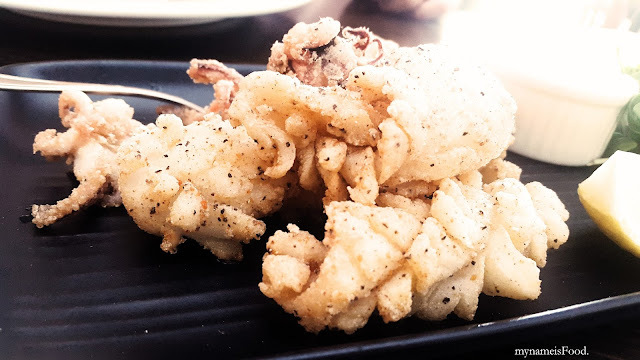 The tartare sauce was nice, was not too strong or too flavoursome which would overpower the calamari. A nice salad is always nice to accompany your dishes when eating such meaty dishes.. in other words, somehow makes you healthier? 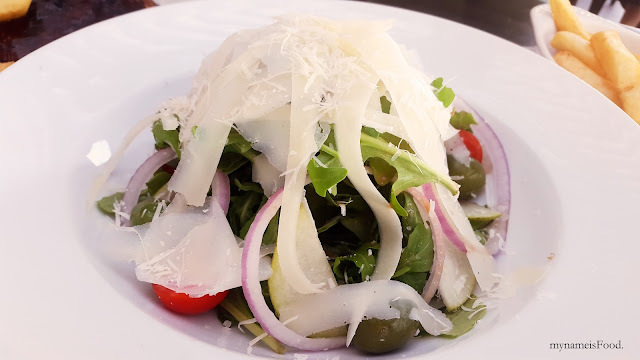 or just the thought of it.. A nice change from your usual salads is the 'Rocket, Pear and Parmesan Salad' ($17/22) was quite generous and was nice dish to share. The shaved parmesan was generous, there were also bits of thinly shaved parmesan as well. 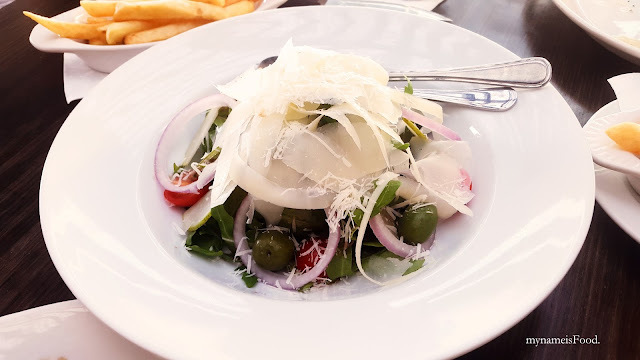 The rocket salad was fresh, halves of cherry tomatoes gave that bit of colour, green olives (sadly with seeds) also gave it that Mediterranean feeling to it. As for the pear, it was shaved thinly which I think actually needed more of it since the salad seemed to be overpowered by the other condiments but not the pear itself. 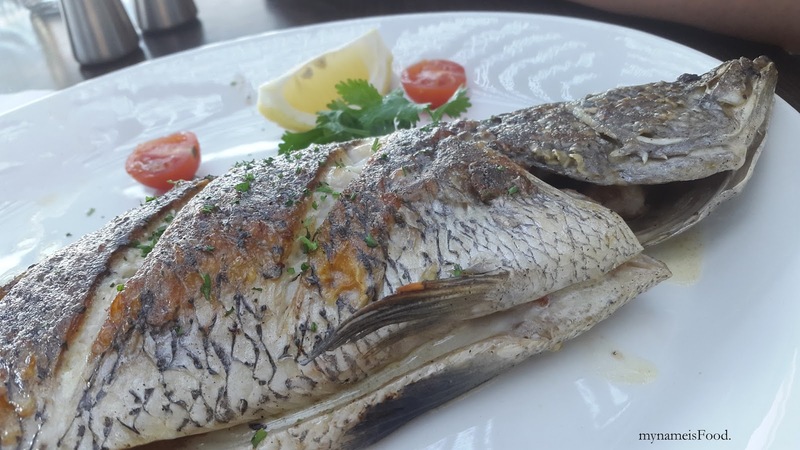 'Fish of the Day' ($36) was a choice of either Salmon Fillet or Whole Baby Barramundi. When the fish arrived at the table, it was rather an odd dish to order maybe to some, since Hurricane's specialty were their ribs. But other than that, the smell and the whole outlook of the fish was well done. 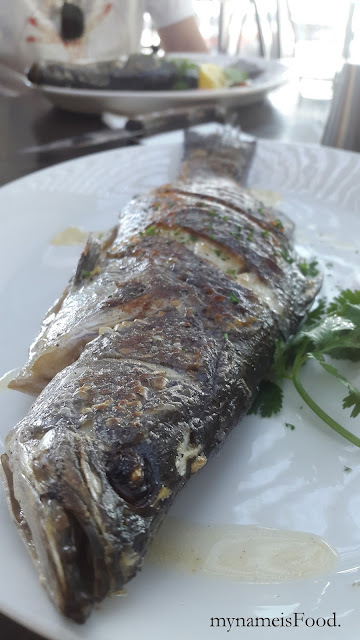 The skin however had some non-crispy areas making it rubbery and weird to eat in a sense but other than that, the grilled Barra skin was yummy and it was nice having the Fish of the Day full without any parts of it being cut out such as its tail or head etc. It quite looked lonely on the plate by itself with only a cherry tomato, lemon wedge and a pluck of coriander. The fish meat was cooked through well, but sharing this dish would be recommended since it was hard to maybe having to finish a whole fish dish by yourself without any condiments either since you have to buy your sauces and surprisingly, not get any sauce for your fish and this considering, a whole fish dish. 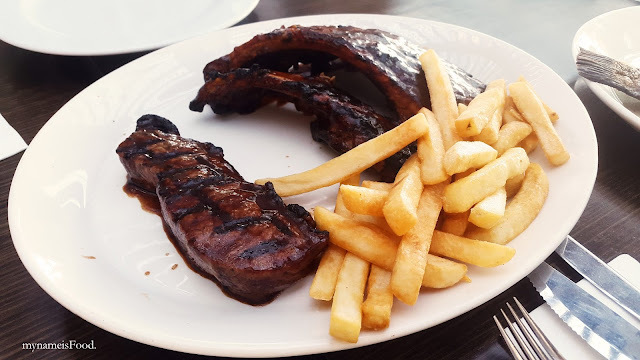 Although it may have been seasoned or spiced, grilled, have that smokey feeling and smell, but eating it together would help your tongue not get bored of it. 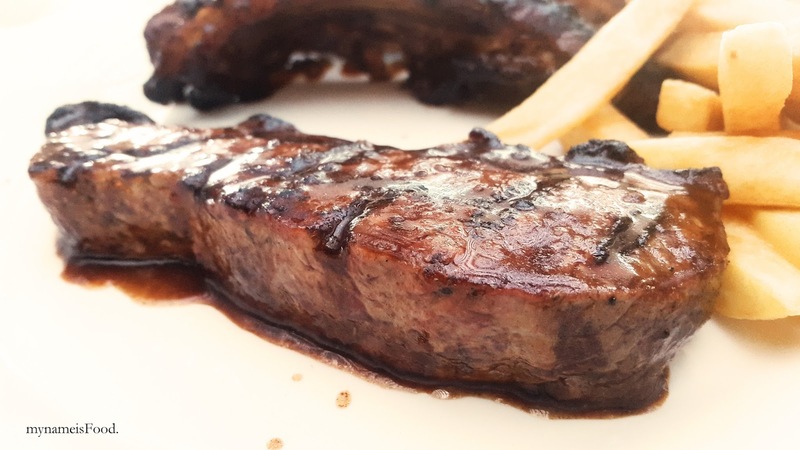 'Steak & Ribs' ($49) was a dish I wold recommend if you don't want to order a whole full rack of ribs but want that bite of steak along with it too. 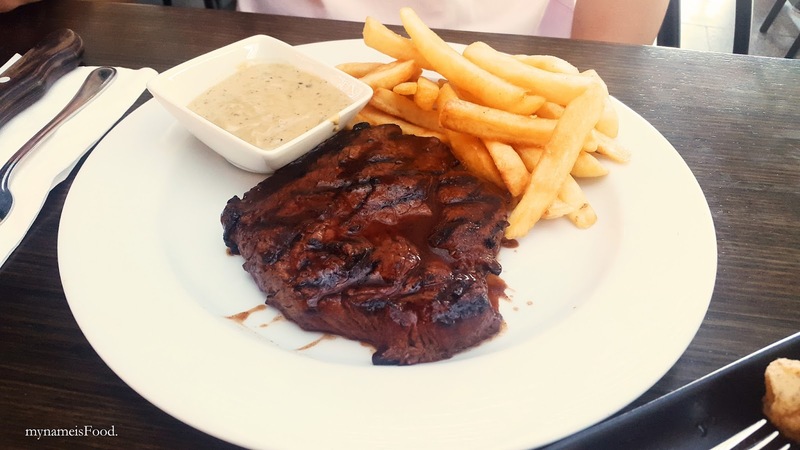 This combo offers that flexibility, with a free range sirloin (200g) and a half rack of ribs served with either chips, baked potato or mixed salad. 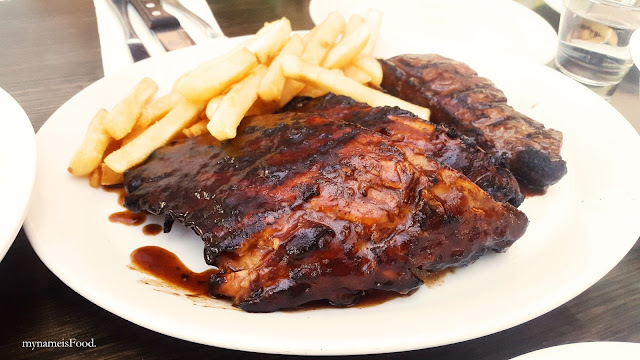 Remember that your steak will not have the same sauce or marination as the ribs, so another good point on why this dish may not leave you all ribs-ed up and saucy or such. The Free Range Sirloin was cooked abit under than what we ordered, as we ordered a Medium Well, it did come out under than that. But other than that, it was a nice and succulent piece of steak. The chips were crispy and the half rack of ribs was marinated well, but again another downside of Hurricane's I have to encounter again was the meat not coming off the bone fully. However, it was slightly better than the ones in Sydney. These ribs did have some parts coming off the bone easier than others. 'Rump' (350g: $36) was a 100 days Grain Fed, Black Angus meat from Warwick, QLD. Supporting our locals huh? Good to know. 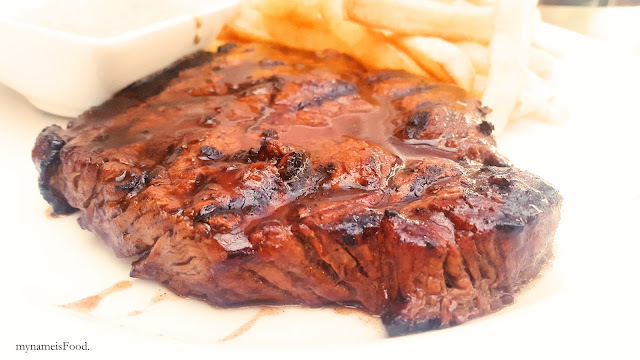 All steaks are served again with a choice of chips, baked potato or mixed salad. Sauces are $3 each and comes with your typical choices in which he chose Mushroom sauce. Again, the rump was cooked under than what was ordered, a Medium had maybe half of it being a bit more on the Medium Rare side which was quite dissapointing for him. Where I didn't mind it as much but some areas I found to be worse than other areas. Flame grilled not as well as they should have but their original basting had quite a flavour which I liked. The mushroom sauce was good, the right amount of mushroom and also the texture was not too watery nor too thick. Chips were good again. 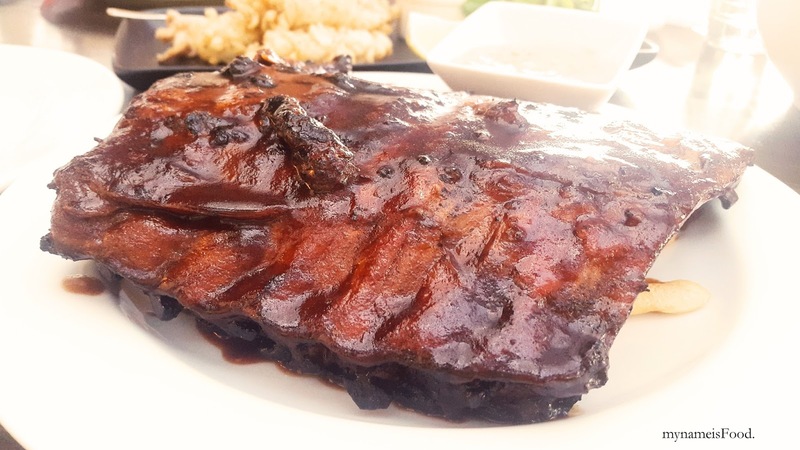 'Pork Ribs' (Full Rack: $47) served with a choice of either chips, baked potato or salad. Chips always works better than the others and I am not sure why, it just does. The Baked Potatoes usually dissapoints me unless they do serve a good damn one such as one with sour cream, chives, bacon on top then ooooh, it gets me. But other than that, do choose your chips or even a mixed salad is good too. But if not, a plain baked potato just doesn't do it for me. 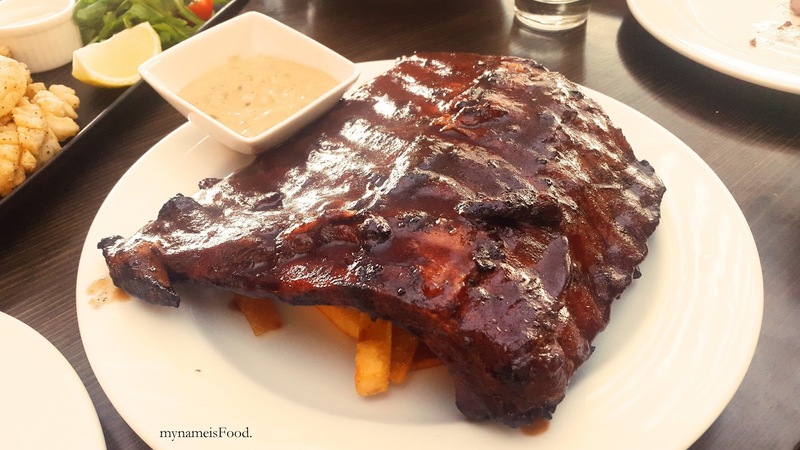 Although the ribs here are better than the ones in Sydney's, it did not make me go crazy for it. Some of the meat did come off the bone easily which we liked, however, other parts of the meat were quite tough and dry although the basting was quite strong too in flavour and saucy wise I liked. Not sure if I would actually totally recommend this place, but once in a while I guess it is fine with all the good view and nice interior and all, plus I know many people always wants to try the Famous Hurricane's but if you want a better ribs, then do give me a shoutout and I will let you know where I think serves the best ribs. I would want to come back again and maybe try their burgers or their other food.